Living, studying and volunteering across international borders and in diverse communities with AFS are life-changing experiences that last forever. That’s why AFS Intercultural Programs is the leading study abroad program for secondary school students, supported and monitored by trained staff and volunteers. Since 1947, AFS programs have prepared young people to become global citizens, empowered with the essential knowledge and practical skills needed to live in a diverse and multicultural world. Our fun adventures are specifically designed for teens to enjoy and learn from. 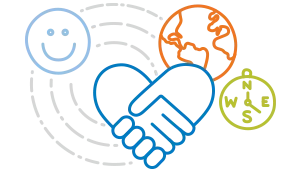 Finally, AFS provides a lifelong access to a community of friends, connections, and volunteer opportunities. What is the AFS Student Learning Journey & Curriculum? The state-of-the-art AFS Student Learning Journey & Curriculum helps students develop on a broad range of education goals for the 21st century. AFS understands the need for young people to develop vital technology skills and be comfortable with technology and science used in education and workplace settings. We also know that many universities and employers seek students and young adults who have a sense of the world beyond their own communities—and are comfortable interacting with people from other countries and cultures. Businesses, government, education and NGOs need people who have international experiences, insights, as well as critical skills required to tackle the defining global challenges of the 21st century. See themselves through the eyes of others. 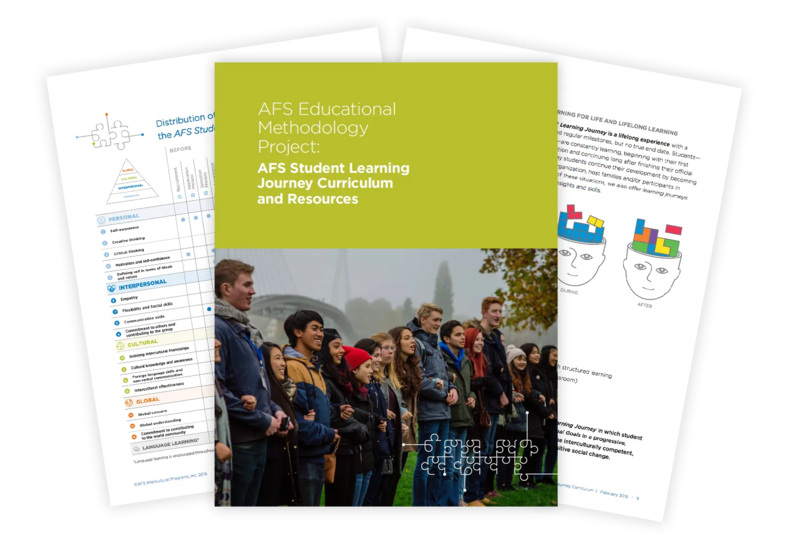 How does the AFS Student Learning Journey & Curriculum help students adapt to their new environment? The innovative curriculum uses a variety of proven experiential learning formats and resources to engage students, help them process their everyday experiences, and learn from their reactions to new, and sometimes difficult, situations. The AFS Student Learning Journey & Curriculum supports students before, during and after their time abroad through group orientation sessions. Students also meet at least once a month with a trained volunteer who uses curriculum activities to help make their intercultural experience more rewarding and meaningful. All these sessions help students develop a deeper appreciation of cultural differences and the most effective and appropriate ways to deal with them, as well as how to apply this learning later in life. Personal values and skills: Students are challenged to reassess their values and practice new life skills like solving their own problems and making decisions. They also learn how to turn difficult situations into valuable opportunities for personal growth. Interpersonal relationship building: AFS students become fully involved in daily living and working arrangements of a variety of people in their new environment. This improves their communication and language skills and teaches young people how to work more effectively in groups and teams. (Inter)cultural knowledge and sensitivity: The AFS exchange experience deepens students’ insights into their home culture as well as their knowledge and appreciation of their host cultures—strengths and weaknesses. Global issues awareness: AFS learning activities encourage students to broaden their perspectives on global issues and concerns, and helps them understand that workable solutions often need to be culturally sensitive to succeed. AFS also encourages and empowers students to use these insights to help build a more peaceful and just world—at home or across the globe. HOW ARE AFS HOST FAMILIES PREPARED AND SUPPORTED TO WELCOME STUDENTS FROM OTHER COUNTRIES AND CULTURES? AFS volunteers and staff are trained on a number of relevant topics, including through the AFS Intercultural Link Learning Program, an AFS network-wide intercultural training and assessment program designed to improve the intercultural competence of volunteers and staﬀ, and enhance our expertise in helping others become more interculturally competent.